An expedition of scientist found themselves trapped in a strange pyramid that will soon serve as battlefield for a war between Aliens and Predators. Few can possibly understand how excited I was when this movie came out. It was for me the meeting of two of my greatest legends. If you understand this, then you may also understand the extent of my disappointment. The movie is not bad, but it could have been so much better. I tend to like Paul Anderson’s movies (Resident Evil series, Pandorum) to a certain extent. They are usually good action movies but with a very limited amount of story. The characters in his films usually lack depth and the plots often poorly justify the action. Well, this is once more the case here. Let’s face it, the characters are not interesting, they are the basic meat for the creature. The story is ultra-basic and explains the very minimum required justifying the presence of this crew here. We are really far from the complex sci-fi scenario of Alien IV here. The good thing is that Anderson did not try to sell us a story, but concentrated on the important point of the film instead, the “versus”. The fights between the Aliens and the Predators are, as expected, the highlight of the movie. They are numerous and good-looking, but overall the film delivers no surprises. As many critics said before me, the dark tone of the image all along the movie also kind of reduce the visibility of the creature, allowing the graphic designer to work with a lower budget I guess, and letting your imagination do the rest. 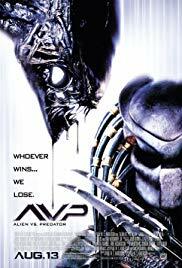 To conclude, AVP is not a bad movie, it deliver the basic entertainment that a versus movie should deliver (same as Freddy vs Jason in a way)…it just delivers nothing else than this strict minimum.